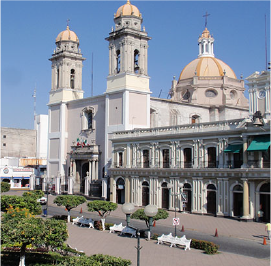 Founded on January 20, 1527 and named Villa de San Sebastián de Colima, the city that today is the seat of the state's capital is one of the oldest settlements of the New Spain, which, despite its age, bears the seal of a youngster in the prime of youth. As the last mayor of the province, don Miguel José Pérez Ponce de León, would have said two hundred years ago, there is good reason for Colima having been established and thriving in the most benign, endowed with Nature valley in the world. Watered by the Colima and the Chiquito rivers, as well as the Pereyra and the Manrique streams, the city was bom among cacao and coconut groves (hence its nickname of the city of palm trees), which, as they grew, became a part of the urban landscape and gave it the exuberance that now both adom and shade it from the tropical heat. Each of the patios and passages in many ancient mansions are shaded by a century old mango, zapote or tamarind tree, old streets are bordered by orange trees, and primroses ready to display their yearly spectacle of yellow blossoms edge the center corridors along new boulevards. Colima is a city of green areas, and a visit to its parks and public gardens helps one to become familiar with its history. One hour and 55 minutes from Grand by highway.